Everything has a limit to how much stress and pressure it can endure. That’s why bridge cables, elevators, and even vehicles have weight limits. Go beyond that limit, and something will snap. The same is true for your body, and the “cables” that hold it together: your tendons. Even your most powerful tendon, the Achilles, can tear under enough pressure and strain. An Achilles rupture is a serious injury that can have long-term consequences, especially if it’s not treated correctly. 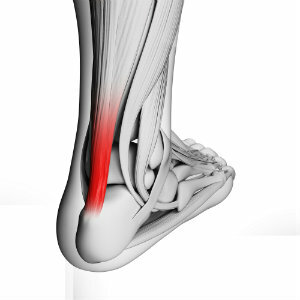 The Achilles is the largest, thickest tendon in your body. It connects your calf muscles to your heel bone to pull on the back of your foot. This pull provides the force for you to rise up on your toes as well as push off the ground to walk, run, and jump. As you might except, this means the tendon deals with heavy pressure regularly to enable you to move around. However, the Achilles does have a limit. An injury that suddenly and forcefully overstretches the connector could partially or completely tear it. Landing a jump incorrectly and falling from high up are two of the most common causes. This injury is also common in sports, when an athlete suddenly ups the intensity of the activity or jumps more than normal. Chronic injuries in the tendon increase your risk for a rupture, too, since frequent inflammation and tissue degeneration stiffen and weaken it, leaving it less able to handle as much pressure. Whether the tear is partial or complete, when it happens you feel an immediate pain and lose much of your ability to push off the ground with that foot. You might hear a “snap” or “pop.” The back of your ankle and heel may swell and bruise, too. Afterward, walking or otherwise using that foot will hurt. The tissue damage needs to be repaired correctly for the Achilles to function well and without pain in the future, which is why getting proper foot care is so important for this injury. Without treatment, you risk chronic pain and weakness in the affected foot—and you may be more susceptible to future tendon tears. To get the best, most accurate treatment, you’ll need to need to have your injury examined and diagnosed. Our team at Absolute Foot Care Specialists will use tests and, if necessary, diagnostic images to determine if and how badly your tendon is ruptured. Then, we’ll help you begin treatment. For a minor, partial tear, conservative care may be all you need. You’ll have to wear a cast or special boot to immobilize your foot as the tendon knits itself back together. When the tissue is completely repaired, you’ll need physical therapy or some additional care to stretch out and re-strengthen your Achilles. For more serious or total ruptures, however, conservative care may not be enough to allow the tendon to heal completely. Surgery may be your better option. A procedure will carefully reattach the torn ends of the tendon. Then, your foot will be immobilized to allow it to heal. Again, you’ll need physical therapy to stretch out and strengthen the Achilles so you can regain your normal range of motion and foot power for your activities. An Achilles rupture is a serious injury that strikes suddenly and dramatically weakens your foot. Getting it properly treated is important for allowing it to heal thoroughly and correctly—otherwise you risk additional ruptures in the future. Don’t wait and put your foot at risk. Contact Absolute Foot Care Specialists for an appointment today if you’re at all concerned about your Achilles. You can reach our Las Vegas offices through our website or by calling (702) 839-2010.